Reminiscent of Chekhov's stories, The Blood of Strangers is a visceral portrayal of a physician's encounters with the highly charged world of an emergency room. In this collection of spare and elegant stories, Dr. Frank Huyler reveals a side of medicine where small moments—the intricacy of suturing a facial wound, the bath a patient receives from her husband and daughter—interweave with the lives and deaths of the desperately sick and injured. The author presents an array of fascinating characters, both patients and doctors—a neurosurgeon who practices witchcraft, a trauma surgeon who unexpectedly commits suicide, a wounded murderer, a man chased across the New Mexico desert by a heat-seeking missile. At times surreal, at times lyrical, at times brutal and terrifying, The Blood of Strangers is a literary work that emerges from one of the most dramatic specialties of modern medicine. This deeply affecting first book has been described by one early reader as "the best doctor collection I have seen since William Carlos Williams's The Doctor Stories." 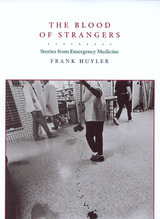 Frank Huyler is an emergency physician in Albuquerque, New Mexico. He is a graduate of Williams College and the University of North Carolina at Chapel Hill, and his poetry has appeared in such periodicals as The Atlantic Monthly, The Georgia Review, and Poetry, among others.